This next beer is the result of a collaboration between Hans-Peter Drexler of Weissbierbrauerei Schneider and Garrett Oliver of Brooklyn Brewery. It comes in two forms, one brewed at each of the breweries, and the two have slightly different hopping regimes. Both are called Hopfen Weisse (“Hop Wheat Beer”); when made in Kelheim the full name is Schneider-Brooklyner Hopfen Weisse. This one is dry hopped with saphir (have I been in a rut recently?). In case you are curious, when made in Brooklyn it is called Brooklyner-Schneider Hopfen Weisse and it’s dry hopped with amarillo and palisade. The Hopfen Weisse is a very cloudy tangerine yellow. It has a bit of off-white head. The aroma is much like you would expect from a hefeweizen: strong clove and banana and some bready, wheaty, and toasty malt notes. In this one, however, there is a distinct citric hop aroma. The nose is delicate but remarkably complex. The already carefully balanced hefe character has found a hoppy companion. The flavor delivers on what the nose promises. Likewise light and delicate, it is a dance of wheat breadiness, yeast clovitude, and hop citricity (that’s right). There is just a hint of alcohol warming, not enough to tell you that it’s over 8 percent by volume. A bit of sweetness keeps the alcohol at bay to let the cloves and exotic fruit flavors shine. That sweetness refrains from hanging around long enough to be cloying, maintaining the delicacy of this beer. P.S. In case you were wondering, that is my saphir single hop homebrew in the backgroud waiting to get racked. 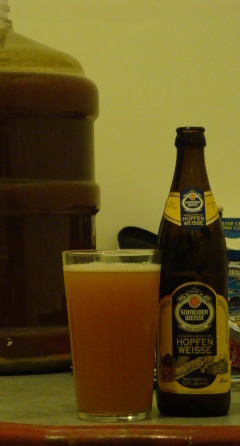 This entry was posted on Tuesday, July 7th, 2009 at 23:37	and is filed under Strong Beer, Wheat Beer. You can follow any responses to this entry through the RSS 2.0 feed. You can leave a response, or trackback from your own site.